Music nerds flock to the shops for the annual celebration of all things vinyl. Bruce Gilbert can't remember which record he bought first. It was probably Deep Purple's Machine Head, or maybe it was Pink Floyd's Dark Side of the Moon. There's also a chance it might have been the Stampeders with From the Fire. Gilbert can't say for sure. It was over 40 years ago and he was just a teenager. But since then, Gilbert's collection has exploded. He's been collecting records ever since, through 8-tracks, cassettes and CDs. "We watched all the formats change over the years," said the 60-year-old Gilbert of his generation. "Some of us are more stubborn than others about changing formats." 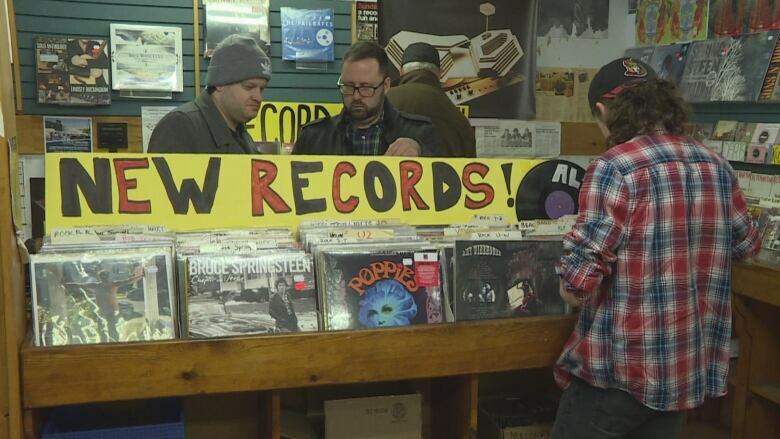 Gilbert, a regular customer at Fred's Records in downtown St. John's, joined hundreds at the shop on Saturday. It's Record Store Day, an annual event celebrated by music sellers across the world. Stores like Fred's offer special promotions to mark the occasion which began in 2008. Many artists produce limited-run releases available only on vinyl. "It's one of the biggest days of the year. It's certainly the only day we have a massive lineup outside," said Tony Ploughman, the manager of Fred's Records. "It goes all the way down to the end of the block, so it's a big day." Gilbert, who has a Spotify account to stream music online, said records offer a unique listening experience. Plus, there's the thrill of the hunt. "For me it's used records, the hunt for the gem," he said. "The one you could never find." These days, Gilbert is consulting heavily with Fred's staffer Andrew Smith who is already cultivating his own collection. The two trade recommendations, which is a common sight at the shop, according to the 21-year-old Smith. "It's a community hub," Smith said. "The same as a coffee shop or book store. It's a place you can learn about things."